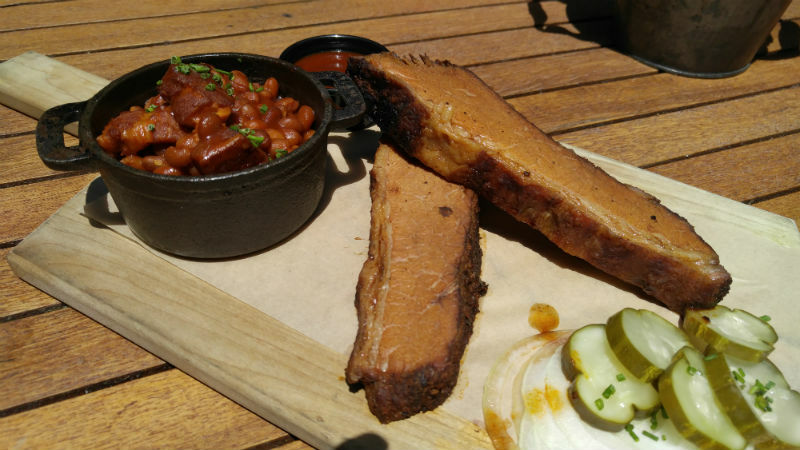 And yet another contender steps into the ever growing BBQ ring here in San Diego. The list just keeps growing with at least four new places in the process of being built as of this writing. 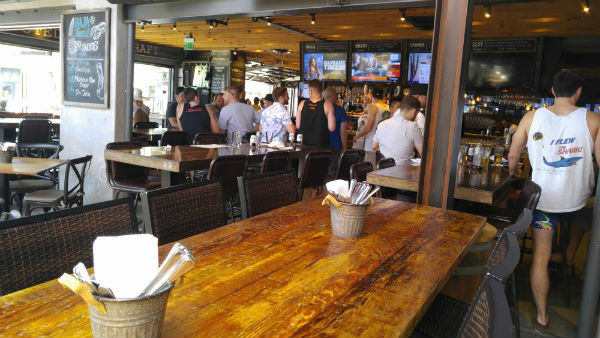 And now, places like Backyard Kitchen and Tap which is not even being touted as a BBQ place, has thrown their hat in the ring. I know there are several others lurking out there, serving up a diversified menu with a chef wanting to experiment with a smoker and some BBQ sauce. On a menu that can claim everything from a crab and lobster roll to scratch meatballs to House mini bacon biscuits to a Portuguese Fisherman’s Stew to a Grilled Scottish Salmon, Executive Chef, John Bickley aims to please….everyone? Well, he sure has pleased this BBQ aficionado. I have to admit, I don’t always go in with the most open mind, especially when I hear that it’s not really a dedicated barbeque joint, but this one passed muster. They opened in January of 2015 and only decided to add some BBQ to their menu about 10 months later. They’re about a block and a half from the ocean in Pacific Beach and directly across the street from one of my favorite ramen places, Jinya. 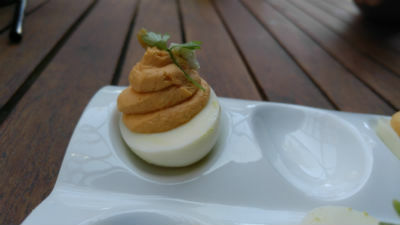 We opted to start with their Buffalo Style Deviled Eggs. Made with hot sauce, and topped with a tiny chunk of blue cheese and crunchy piece of chicken skin, it was a delicious bite in my mouth. Then, out came our entrees. The thickest cut brisket I’ve ever seen. 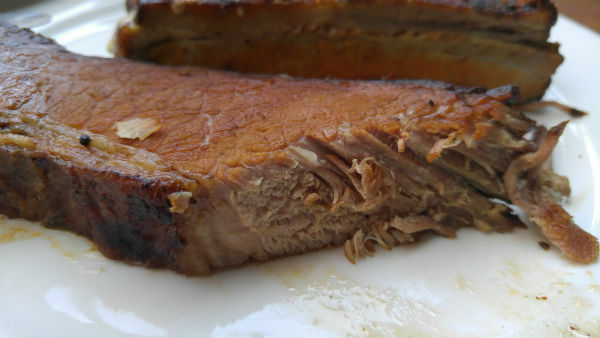 This can be worrisome sometimes as a pitmaster may be trying to cover up the fact that it is way overcooked by slicing it thick so it won’t fall apart too easily. This was not that. Conversely, when cut too thin, they may be trying to avoid letting you know that it was undercooked and tough. While not the most moist brisket I’ve tried, it certainly was tender and was crowned with a nice layer of fat. 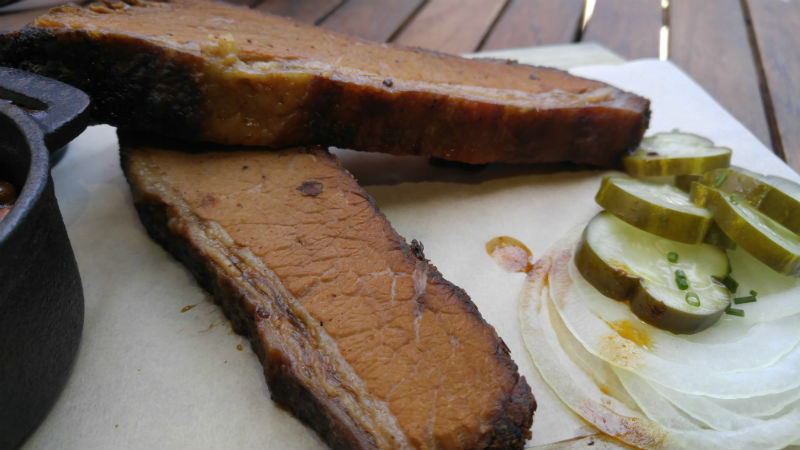 The menu claims that it’s smoked for 14 hours, but there was no tell tale red smoke ring on our slices. Hmmmm. 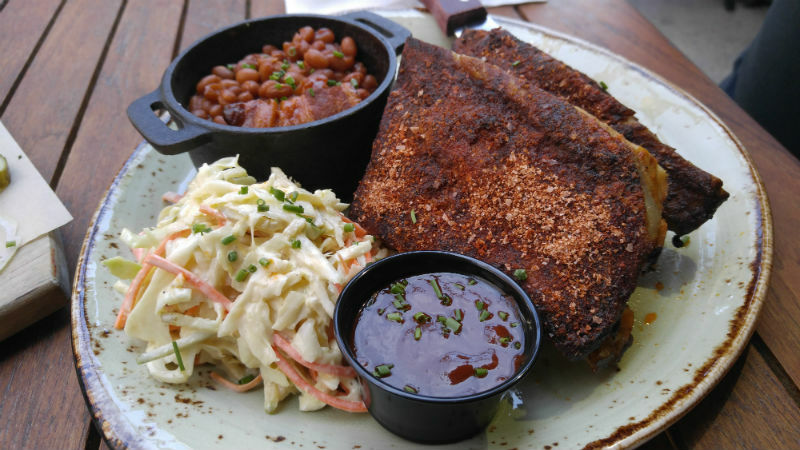 And of course, being the rib girl, I had to order St. Louis cut pork ribs. I asked for both the brisket and the ribs to not have sauce slathered all over and they came out with just the dry rub on it. While the dry rub tasted a might salty, I realized that this must not be the way Chef intended to serve them and sure enough, when John came out to see how we liked everything, it was confirmed. He usually serves them with a light glaze of his scratch made sauce baked a bit on top of each rib….just the way I like them. Lesson learned. From now on, I need to ask how they are served. Is it drenched in sauce without any being baked onto them? No thanks. Same goes with the brisket here. Get it the way Chef intended. He then made us a few more ribs with his method and they were so much better. The saltiness disappeared into the sauce and the flavor and texture were classic. The ribs were tender to the point of just falling off the bone but didn’t. That is exactly the way they should be for this rib lover. Chef John does have a small smoker out back and said he uses Hickory wood. I didn’t see any smoke rings on the meat but I also didn’t taste much smoke in the food. Would have liked a bit more of that. I guess I have to take his word for it because I was not allowed to go back there and video tape as I usually would. That would have required some previous approval from the higher ups he said. 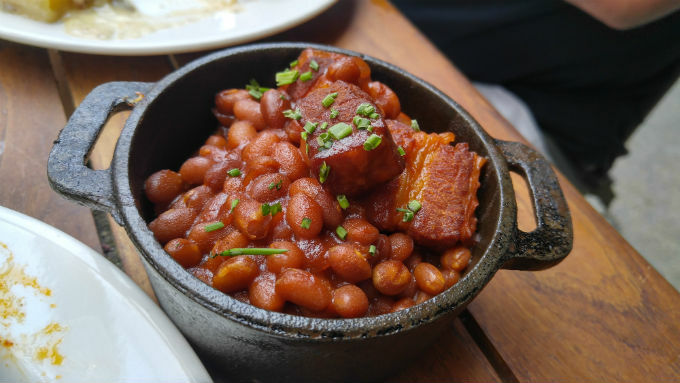 Even the beans were made extra special by having large chunks of pork belly in them. Not too sweet, but just right. 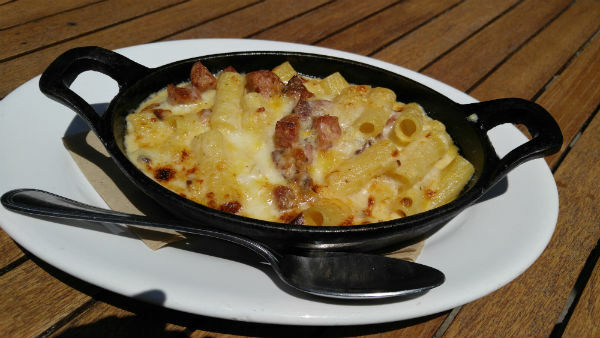 We also tried their Three Meat Mac & Cheese. I’m so often let down by Mac & Cheese that it has to be extra special to win points with this girl. This was more than special. It was devoured by both myself and my friend! Hard to go wrong peppering it with Andouille sausage, tasso ham, and bacon….mmmmm….bacon. It also had white cheddar cream, parmesan and big rigatoni. It was definitely top ‘o the heap for me. 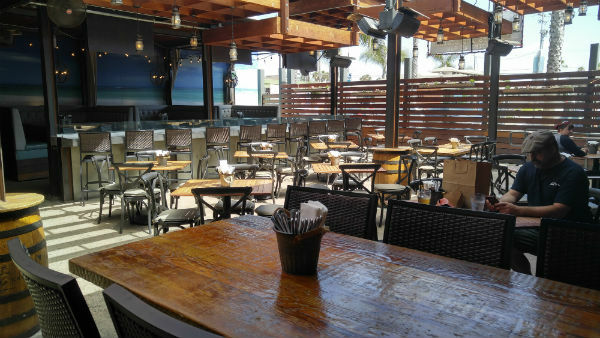 All get measured up to one that is quite similar at Mother’s Saloon in Ocean Beach. This one is right up there. The cole slaw was not one of my favorites, but that is ok considering how impressed I was with the rest. It certainly wasn’t bad, but might have been lacking a bit of acidity to bring out the flavor more. 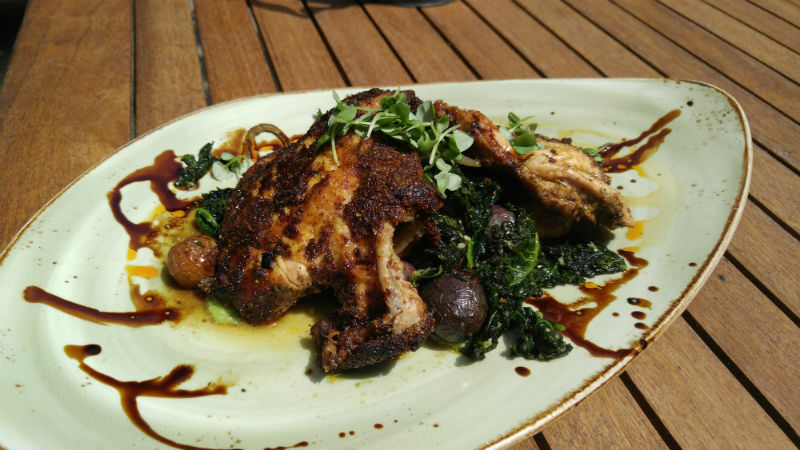 We also tried a non barbeque dish, Mary’s Organic Jerked Chicken. A boneless thigh and breast with a not too spicy, but just right jerk seasoning on it. It was tender and juicy. Served with marble potatoes, sautéed black kale and a scallion pesto. We were told by manager Megan that it is one of their most popular dishes and we can see why. My lunch partner, Jeb ordered a beer off of their plentiful craft menu and enjoyed his libation. Our server, also named Megan was great and hopefully, you can expect good service with a smile like that on your visit. I’m looking forward to going back and trying their diverse menu in the very near future and you should too. Texas Red Beef Cheek Chili with cheddar cheese curds, min bacon biscuits and sour cream?? YES PLEASE! What is even more amazing, is that on Mondays from 3-10 pm, they have an all you can eat BBQ special of their ribs, brisket and chicken platter for only $22.95! I don’t know anywhere else doing that kind of deal. Bring it! They do have separate lunch, brunch and dinner menus with some similar items on them. Chef allowed me to choose from any during our lunch time meal, but that is not guaranteed, always check first if not sure. Giant venue. Hi top stools, lo tables and some very lush booths surrounding the two rooms. All open to each other and to the street. Big bar in the middle. Hey, it’s PB, ya know?